Huh, it was my dream machine back in the days, great teardown. It seems anachronistic to me that such a compact computer has a big linear power supply... were switch mode AC/DC power supplies really not invented back then? Or was it cost saving to just use a big linear transformer running at mains frequency? Damn, I love those vintage computer teardowns. Especially Apple machines, they aways put some extra effort into them =). Does the drive work better after the cleanup? Good tear down, which demonstrated good quality even though there were a few wire-adds. For its day, Apple did a pretty good job, but you paid for it. In 1984 I bought a Rotten Apple from the notorious Golden Centre in the aptly named Sham Sui Po district in Hong Kong. The Golden Centre was the world's biggest software pirates den, often raided by Hong Kong police. The ground floor hosted around 200 or so tiny stores mostly selling pirated hardware and software by Triad foot soldiers. In the upper floors the criminal gangs were duplicating commercial software for minicomputers and PC's. I bought a pirated Apple II there for a fraction of the price of a genuine Apple. It was a piece of crap... full of hardware bugs and dodgy workmanship and design. But I was able to rebuild it to be reliable, like replacing every semiconductor and capacitor in the fake "Made in Japan" power supply. In the end, it served as a good machine. In my opinion the best thing about Apples and Rotten Apples was an addictive strategy game called Conan . Not forgetting Sargon . And me old mate Print Shop . On that machine, I wrote software a Morse Code trainer in 6502 machine code (not Assembly Language, but actual machine code). I would never bother with machine code these days... no need. In fact, there is almost no need to bother with Assembly Language, as free C compliers are commonplace. I sold the machine in 1986, upgrading to an IBM clone. Seems to, yes. Some of the disks look physically damaged though. I really like this machine, and try to get one for a normal price (I saw some people on ebay trying to sell them for more than 100€ untested, without the power brick etc.. :/) but without any luck right now. This is a really neat version of the Apple ][. By the way, the composite is capable of color in NTSC only if I remember correctly, and the RGB output may need an adaptor to works. You are true that we can use the internal and external drive at the same time. What impress me is that the main floppy motor belt is still good! In my opinion the best thing about Apples and Rotten Apples was an addictive strategy game called Conan . The original Apple II had a switch-mode power supply (internal, not an external brick). I recall that switching supplies weren't the most common at the time, but certainly not unknown. As far as I remember, back then, I also found that "jitter" on the CPU clock. I think, it was sort of a bus / CPU hold state from the timing circuitry, either for the display (as it had no dedicated graphics chip), or for the DRAM refresh, (as it also had no dedicated memory management chip), or maybe both. If I'm not mistaken, you should find about 1 extended clock phase on 100, so the effective clock rate was about 1% low. The timing for all these periphery was the most trickiest part on these machines. This was done to get the numbers to work out correctly for NTSC video timing, as the core logic (implemented as a bunch of 74LSxxx chips in the II and II+, reduced to two chips in the IIe and IIc, and reduced further to one chip in the IIGS) interleaves memory access between the CPU and video generation. Memory is clocked at twice the CPU speed; on every other cycle, it's available to the CPU, while the video hardware gets it on the in-between cycles. DRAM refresh is a side effect of video generation. As a result, the CPU never has to wait for video generation or DRAM refresh. Woz is an effin' genius. the core logic (implemented as a bunch of 74LSxxx chips in the II and II+, reduced to two chips in the IIe and IIc, and reduced further to one chip in the IIGS) interleaves memory access between the CPU and video generation. Memory is clocked at twice the CPU speed; on every other cycle, it's available to the CPU, while the video hardware gets it on the in-between cycles. DRAM refresh is a side effect of video generation. As a result, the CPU never has to wait for video generation or DRAM refresh. Interleaved CPU/video was fairly standard practice at the time (it avoids display glitches and got you DRAM refresh for free). One of the peripherals you could get for the Apple // series were a pair of Game Paddles, just a variable resistor inside but they were still expensive. Each half of the 556 timer chip had its frequency (and therefore its position) set by a paddle. Hi to all the ex members of Manchester Apple Users Group who used to meet in the Staff House at UMIST. 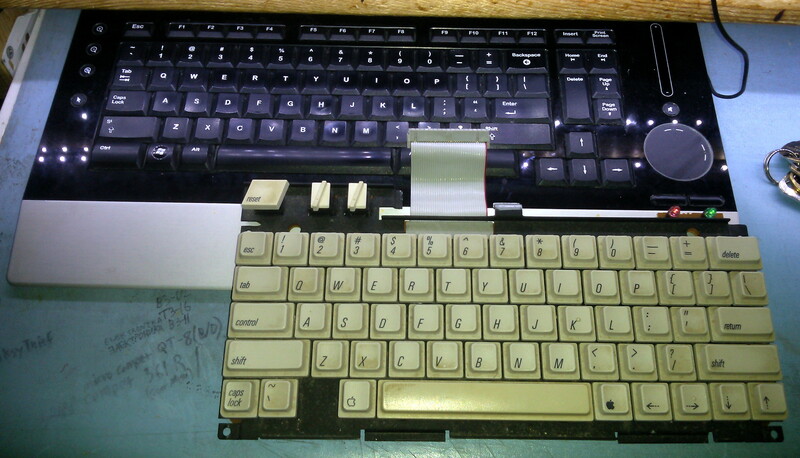 The third (hardware) revision of the //c updated the keyboard to use Alps Amber mechanical keyswitches. They seem similar to Cherry Blue, but with a little more force required to press. These were used int he latter half of the first version (rev 3 was the memory expansion version). The keyboard has an aluminum key plate to give it it's rigidity, and ditched the plastic brace of the Rev 1 and 2 variants. The //c Plus is the one with the 3.5 inch floppy, and the slider volume. I believe it used Alps Orange keyswitches, which are what the IIgs keyboard used. I think those were a linear switch... The Ambers were tactile... clicky-clicky! There actually were a couple keyboard layouts. Some European layouts used the keyboard switches, not for a Dvorak layout, but for additional international character layouts. It ended up being used for Dvorak simply because the switch was already there. I'm installing this keyboard in a Kerbal Space Program "Command Module" themed controller, similar to the one Dave played at the Sydney Maker Faire! Brings back memories, cutting the notch out of the other side of the floppy disk, so you could turn it over and use it on the single sided drive. I hope someone sends you some old marine electronics sometime (Furuno stuff with all through hole parts) but more importantly old Roland, Korg, Sequential Circuits or Moog stuff. I hope you get time to do the giant mixing board video soon but I assume that you probably need to be single like Mike Harrison to find the time to tackle the ultrasound machine. In fact, as Dave quoted during the video, the 6502 have 3 phases clocks, Phi0, Ph1 and Phi2. Phi0 is the main clock, and is an input on the 6502, Phi2 is the "external device" clock or I you say, the clock is used to know when the 6502 is not using the Address and Data bus. Phi1 on the contrary is the reverse. The 6502, divide the main clock in 3 parts, 1 for A/D bus access and 2 for internal work, so clever device like the Apple 2 use Phi2 to know when the 6502 is doing it's internal work, and the external hardware (the video generator in this case) steal the bus for the 2 period where the 6502 doesn't use the bus. Some other 6502 base computer also used the same trick (like the Oric 1/Atmos) where the video chip use the same steal method as the Apple ][. The problem on this specific computer (and some other I presume) is that the Phi2 output of the 6502 is not made to be directly used, and should be buffered before anything. And when you look at the shape of the Phi2 output you'll understand why.. It's just awful and nearly does not looks like a clock.. This is because this output is not buffered inside the 6502. The number of 198x floppy drive that use a belt for the main motor, where the belt is completely dead (how do you say that dave ? Goneski? Joystick port. One 555 for each axis. Charge up a capacitor, discharge it through the potentiometer in the joystick, and use the CPU to count how long it takes to discharge. There was a ROM routine (and a BASIC command) that did all of that for you, but you could write your own code if you wanted to measure resistance values beyond what would've been used in joysticks. Other Apple IIs used a 558 to support two joysticks. I started with a IIe in 1985, which I upgraded to a IIGS (by way of a motherboard swap) around 1992 or '93. Still have it, as well as some more Apple IIs I've picked up cheap through the years. Never had a IIc, though. Joystick port. One 555 for each axis. Charge up a capacitor, discharge it through the potentiometer in the joystick, and use the CPU to count how long it takes to discharge. Oh, of course. I forgot that's how they used to read joysticks. All the clever Wozniak hacks are only neat from the hardware startup perspective. They were useful when Apple was launching, but made this computer pretty archaic and bad in 1984. Saving few cents for the price of no real floppy error correction (sum of all bytes instead of industry standard crc, trivial to miss errors) and cpu hogging (all the floppy decoding in software). Same for graphics, no sprites no scrolling, all the color modes with idiotic bit patterns/interleave and limitations (140x192 of real usable resolution and so on). Its not like Apple was struggling, they were selling this pos at >$2000, they had HUGE profit margins. Whole Apple 2 line was what kept Apple alive for a long time (deep into Mac era). $50 million blown on failed Lisa alone is a testament of fat profits on Apple 2.
c64/Atari 800xl creamed it when it comes to graphics, sound and price. I wonder what could of been if Visicalc didnt start on Apple2.